Phoenix (Arizona) – June 11, 2018 (travelindex) — With direct spending on business travel totalling more than $317 billion last year, according to The U.S. Travel Association, Best Western Business Advantage is doing its part to help small and mid-sized businesses save money and reap rewards. 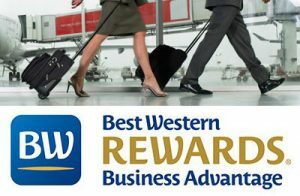 On top of the outstanding incentives that come as part of the free program, Best Western is providing all members a $20 Best Western Travel Card after their first stay this summer. Travel must be booked and fulfilled between May 21 and September 3, 2018. — Preferred Rates — There are exclusive discounted member rates for qualified businesses. — Automatic Elite Level Status Upgrades — Account owners are instantly elevated to Diamond Status and employees are elevated to Gold Status – so everyone in the company wins. — 10% More Bonus Points — Business or account owners earn 10% more bonus points from their travelers’ stays, which can be used for future business stays, company incentives, and more. — Free Memberships – Members receive a free annual membership to Tripit Pro, the all-in-one travel organizer, as well as enrollment in Avis Preferred®, which helps speed up the car rental process. — Exclusive Promotions – Members receive real value through special offers and discounts. In 2015, Best Western Hotels & Resorts embarked upon a brand refresh, deploying more than $2 billion in strategic renovations and best-in-class initiatives to enhance the features that matter most to today’s travelers. Today, with a reimagined loyalty program offering more value than ever before and enhanced breakfast services, which recently earned the top spot in the category of food and beverage for midscale, according to J.D. Power’s 2017 North America Hotel Guest Satisfaction Index Study, Best Western is proud to be giving travelers – and the professionals who book travel for their businesses — exactly what they want. Best Western Hotels & Resorts headquartered in Phoenix, Arizona, is a privately held hotel brand with a global network of 4,200* hotels in more than 100* countries and territories worldwide. Best Western offers 11 hotel brands to suit the needs of developers and guests in every market: Best Western®, Best Western Plus®, Best Western Premier®, V?b®, GL?®, Executive Residency by Best Western®, BW Premier Collection®, and BW Signature CollectionSM by Best Western; as well as its recently launched franchise offerings: SureStay® Hotel by Best Western, SureStay Plus® Hotel by Best Western and SureStay Collection® by Best Western. Now celebrating more than 70 years of hospitality, Best Western provides its hoteliers with global operational, sales and marketing support, and award-winning online and mobile booking capabilities. Best Western continues to set industry records regarding awards and accolades, including 64 percent of the brand’s North American hotels earning a TripAdvisor® Certificate of Excellence award in 2017, Business Travel News® ranking Best Western Plus and Best Western number one in upper-mid-price and mid-price hotel brands, and Best Western receiving seven consecutive Dynatrace® Best of the Web awards for its leading hotel website. Best Western has also won nine consecutive AAA®/CAA® Lodging Partner of the Year awards, recognizing the brand’s commitment to providing exceptional service and great value to AAA/CAA’s nearly 58 million members in the U.S. and Canada. Best Western-branded hotels were top ranked in J.D. Power’s 2017 North America Hotel Guest Satisfaction Index Study – ranking first in breakfast (food and beverage category) for midscale; and second in overall guest satisfaction. Over 32 million travelers are members of the brand’s award-winning loyalty program Best Western Rewards®, one of the few programs in which members earn points that never expire and can be redeemed at any Best Western hotel worldwide. Best Western’s partnerships with AAA/CAA and Harley-Davidson® provide travelers with exciting ways to interact with the brand. Through its partnership with Google® Street View, Best Western is the first major company of its size and scale to launch a virtual reality experience for customers, setting a new industry standard and reinventing how guests view hotels.